Greg Sandow, in his first of a series of three posts of a “timeline of the crisis,” gives us a graph of search results (fig. 1) for TIME Magazine search results for “Orchestra” compiled by Michael Di Mauro. Set aside the fact that the graph is an attempt to be a bivariate analysis (the Entertainment / reviews relevant to ‘orchestra’ is simply a subset of the total search result) “comparing” Employment rate with search results (I’m not even sure why this is included here), it is really just a univariate analysis describing one type of data–namely the “orchestra” search result. Could the meaning of it be any clearer? It shows classical music losing its force in American culture. The mentions of orchestras — in both articles and music reviews — fell by two-thirds in 1969, and continued to fall after that, picking up only in the past few years. The threat to magazines, many of which competed directly with television for national advertisers, was even more severe. Much like the radio industry, the magazine industry retooled and adapted to the new media environment. As magazines changed, economic necessities were the key factors shaping their evolution. In the 1950s, industry leaders began to transform their products to survive in an era when they would be a secondary medium in the shadow of television. The Magazine industry followed a strategy similar to radio, moving from general interest national magazines to the specialized magazine with a demographically targeted audience. One indication of change in the magazine industry was the financial failure of several high circulation national magazines. Between 1969 and 1972, three of the most widely read magazines in the country–the Saturday Event Post, Life, and Look—all folded. While each of these weekly magazines had more than 6 million readers, they maintained such high circulation revenues to stay afloat. As national advertisers shifted their attention–and their dollars—toward television, the national magazines who offered general interest fare to a mass audience (just what television was offering) quickly lost ground with advertisers. Advertisers, in fact, deserted these national magazines before readers did. Despite continuing popularity among readers, the economics of the magazine industry led to the shutdown of these widely read publications. This is a classic example of the unique dynamics involved in the “dual-product” market within which media firms operate. In this case, even though magazines were able to attract a large readership, it was abandonment by advertisers that led to the demise of these publications. The market was respond to the “customer” who really mattered: advertisers. With television dominating the national media scene, particularly in the eyes of advertisers, the magazine industry turned toward specialized publications for niche markets. Such targeted publications—for young women or sports fans or nature lovers–could succeed in financial terms with smaller circulations because they attracted specialized advertising that was directed at the target audience. Advertisers interested in reaching demographically specific audience segments (by age, gender, region, etc.) or readers with a passion for a specific set of activities (sports, cooking), etc.) were perfect matches for the new specialized magazines. These new magazines, that began to populated the newsstands beginning in the 1960s, provided a high profile alternative for advertisers who did not want, or could not afford, the national marketing campaigns that were the domain of network television. First, it seems unlikely on its face. 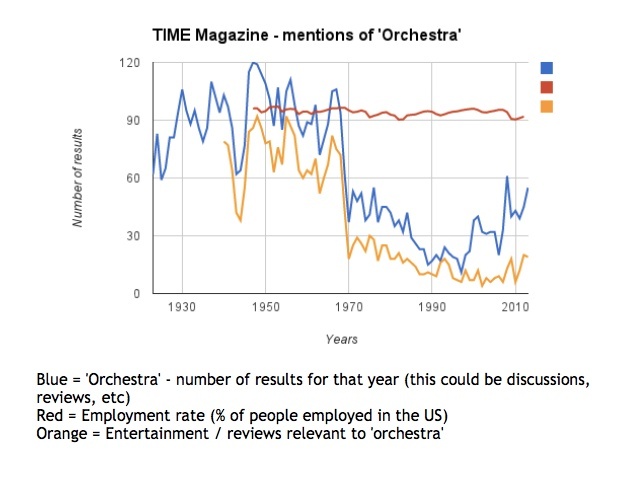 The number of items in Time mentioning orchestras decreased to less than a third of what they’d been in the past. Can this have been due largely to a change in format? Hardly seems possible. There were, after Luce’s death, so many fewer items in each issue of the magazine? The other thing to say is that your hypothesis can easily be tested. All we have to do is search for some word that — thinking of the overall state of our culture — would be as likely to show up in, let’s say, the 1930s and the 1970s. So i searched for “baseball.” The word appeared in 82 articles in 1939, and 71 in 1979. If your hypothesis proved true, we’d expect to see many fewer articles with baseball in them in 1979. But we don’t. The hypothesis appears to fail. Why Greg randomly picked those dates, I don’t know. He could have used 1969 (87 articles) and 1973 (88 articles) to better make his case that there wasn’t much change. Or even better, he could have selected articles 1928 (52 articles) to contrast with his 1979 (71 articles) selection to show there’s actually been an increase in mentions. Alternatively, he could have picked 1957 (131 articles) and 1974 (56 articles) to show that baseball has lost force in US culture and fallen by nearly two-thirds! Point is, it’s easy to cherry-pick to make your case. 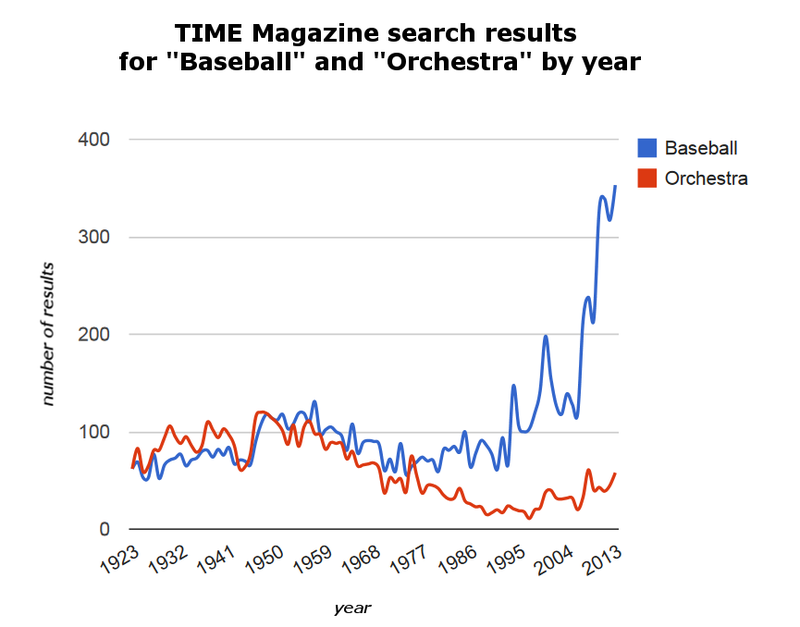 I was actually curious in what was really the trend, and used a line graph to show a bivariate description of search results for “Baseball” and “Orchestra” (fig 2. – you can view it as a Google visualization with mouseovers for the individual datapoints here) and discovered that until the late 70s the number of articles follow a very similar direction, if not number. As I said above, by 1974 the number of articles for baseball had fallen to 56 and hovered in the 60 to 70 range during the 70s. This is after a high point of articles during the 50s to early 60s where the number hovered in the 90 to 120 range (with a peak to 131 in 1957 as mentioned above). The divergence in the late 70s is of interest as my response to Greg’s cherry-picked example discusses the historical context of the post-Sports Broadcasting Act which led to Sports leagues creating broadcast licenses in the 1960s and after. With increased media concentration, this has only accelerated and we can see that there’s a sharp upward trend (with some dips) in articles about baseball. Curiously, the highest number of articles is in 2013 (355) which has yet to end. Also note that there is also an upward trend in Orchestra articles as well, though very modest and it doesn’t come close to the low point in 1943 (where we have 62 articles) until 2008 (61 articles) and 2013 (58 articles to date). Interestingly, during the 30s and early 40s there was also a rise in number of articles. I suspect that with the creation of 150+ orchestra by FERA and the WPA Federal Music Project and the many thousands of concerts and educational initiatives contributed to the small divergence between Baseball and Orchestra articles. Note that by the late 40s and early 50s articles both rose sharply after a short dip in both – likely due to more focus on the War during the dip and post-WWII prosperity afterwards. Of course, neither of these tell us much–this is one print entity amongst many thousands and whatever trends we see here may not be reflected in other print entities. But now I’m curious as to how much media concentration in megacorporations has contributed to the rise of Sports (and Pop Music). As I mentioned in a previous post between 1969-1973, the Gate revenue for Major League Baseball averaged 61% of total revenue. 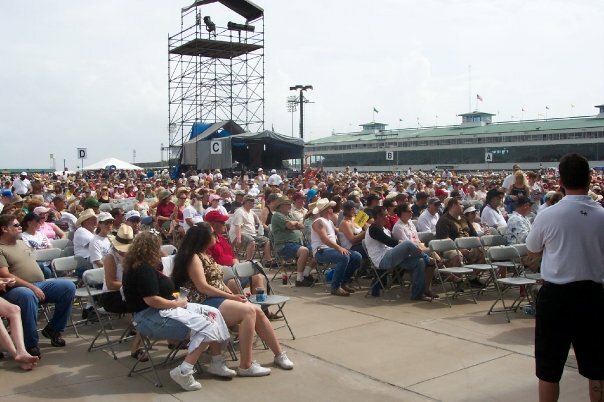 By 2001 Gate revenue was 40% of total revenue and by 2006 35%. Might be interesting to see how closely the increasing proportion of media licensing revenue follows increased media exposure. In the end, all this tells us is how much TIME Magazine values these things and as it slowly moves in the direction of its competitors, Newsweek and US News & World Report, into digital-land, maybe what it thinks isn’t particularly relevant anyway.